I’ve written many times on this blog about ROWE (the results only work environment). It’s the structure under which I work, and I’m a big fan. One of the key tenets of ROWE is that it’s available to everyone: it’s not something reserved for those at a certain paygrade, it’s not restricted to leaders, it’s not something you have to apply to be a part of, or provide some kind of justification of your particular circumstances to gain entry. There should be no barrier to entry. When I first wrote about ROWE on this blog, I lamented that at my organization there is a barrier to entry, to a certain extent. Not by design, but simply because our communication mechanisms are restricted by our firewall and access to them from outside the corporate network is barred. The barrier to entry, as I see it, is having a company-issued cellphone. If you have one you can be available from wherever you might happen to find yourself, and if you don’t you’re tied to your computer. I didn’t have a company-issued cellphone when I wrote that, but I do now. There it is above. 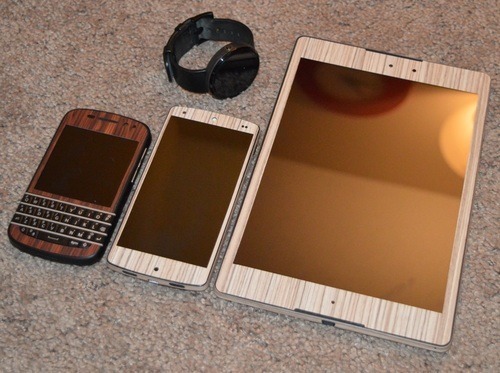 It’s the one with the darker wood effect amongst my bamboo effect personal devices. I love it, and I hate it. I don’t want it, and I wouldn’t give it back. Read on to learn why! Quite simply, when I thought not having this device constituted a partial barrier to ROWE entry, I was right. Last week Flo and I went to Winnipeg and I worked from there for the week. I spent most mornings sitting in Flo’s sister’s kitchen working at my laptop, then we’d typically go for lunch together and I’d spend the afternoons with my extended family. I was available throughout to respond to emails and IMs. If somebody called my office phone number then their call was seamlessly forwarded to the phone in my pocket. Most of the work people I interacted with would have had no idea I wasn’t at my desk, let alone that I wasn’t even in the same time zone. That wouldn’t have been possible if I didn’t have this phone. The point ROWE is that I’m an adult, and I work how, when and where I choose to. I could be working at any time and from any place. Having the phone feels a little bit like I am working at all times, from all places. Essentially having the phone means the thing I find most challenging about working in a ROWE – knowing when to switch off – is magnified exponentially. Obviously the phone has an “off” button and, being an adult and all, I am free to use it as I choose, but I simply don’t find it as easy as that. Take last week as an example: when I was out spending my afternoons with family every now and then I’d receive a work-related message of some description. I probably dealt with 80% of them right away, because 80% of my job is more about getting the right people in contact with one another than it is about actually doing something myself. The remaining 20% I flagged to deal with the following morning. The inward flow of these messages is not overwhelming, but it is constant. If I disconnect entirely, even for an afternoon, the sheer volume of stuff that builds up is overwhelming. I don’t like to feel overwhelmed, so I keep my phone on because it’s easier to take a couple of minutes out of what I’m doing a few dozen times than it is to try to deal with a few dozen things at once when I eventually choose to reconnect. There are certainly times where I hate remaining available and connected and doing so gets in the way of other things I’m doing at that moment, but despite that the logic above kicks in and even when I need a break I end up being reluctant to take one. And, as I mentioned, the inward flow of messages really is constant. With most of the people I work with also being in a ROWE it starts at about 6am and continues until about 1am, each one bringing with it a little “ding” noise. I feel like Pavlov’s dog sometimes. Despite the occasional strength of my negative feeling toward my phone, none of that has anything to do with why I don’t want it. The benefits outweigh the drawbacks, and the issues I have with it are a function of my choices, not of the technology. I can get better with it, and over time I will. My inability to switch off was a minor problem when I carried a laptop. When that laptop was supplemented with a phone it became a bigger problem. If that work-only device were replaced with an app on my personal device through which I access work stuff? It could be disastrous. I never switch my work phone off, but I do leave it at home when we go out somewhere in the evening or on weekends. I take my personal phone with me everywhere though. I assume that BYOD technology includes functionality that would let me turn “work” off while keeping “personal” switched on, but am I disciplined enough to use that function? Probably not.